DNA barcoding is a genetic approach to species identification. It involves sequencing a region of a specific gene – cytochrome c oxidase 1 (CO1) – which can be found in the mitochondria of every cell in every animal. The advantage of using COI is that it is short enough to be sequenced quickly and cheaply, yet long enough to provide a unique ‘barcode’ for each species. Once the barcode sequence has been obtained, it is placed in the Barcode of Life Data Systems (BOLD) database – a reference library of DNA barcodes that can be used to assign identities to unknown specimens. BOLD is a searchable repository for barcode records, storing specimen data and images as well as sequences and trace files. It provides an identification engine based on the current barcode library and monitors the number of barcode sequence records and species coverage. 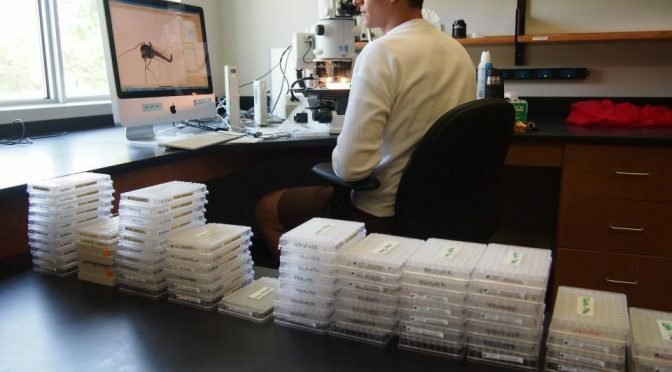 DNA barcoding has been used as a tool for species identification in a wide array of practical applications that include monitoring pests and species at risk, surveillance of invasive and endangered species, and the authentication of food and herbal products.